New Orleans is a city that is characterized both by beauty and by the tragedy that breeds it. Known for its focus on portraying the city of New Orleans, the art of this city struggles to accurately represent its own tumultuous history, which has led to the adding and removing of several confederate monuments and buildings that connect race, time, and oppression. In the wake of Hurricane Katrina, artists have invigorated the city with inspiring public pieces. In 2013, eight years after Katrina, The Helis Foundation presented the Poydras Corridor Sculpture Exhibition. In this exhibition, the Myth Makers— a Boston-based art duo— introduced an installation called Avian Avatars, a series of twenty-foot tall birds fixed on the streets of New Orleans (3). Each bird is specific to its site and tells its own story. One of the sculptures in the series, The Realist, depicts a twenty-foot tall red tail hawk installed on Poydras street between S. Claiborne Ave and S. Galvez street. The sculpture is not accompanied by a detailed description of its meaning, nor by a long-winded explanation of its purpose. It is a twenty-foot tall representation of post-Katrina New Orleans and the millions of people who were affected by the storm in various different ways. Andy Moerlein and Donna Dodson are the creative minds that make up the Myth Makers. Moerlein and Dodson share a passion for the natural world and allow concepts of wilderness, nature, and animals to inspire their work. While Moerlein is motivated by the physical effects of events occurring in the natural world, Dodson is creatively inspired by the enigmatic nature of wild animals (3). Although it is not presented in the same traditional form of news as a newspaper or magazine article, The Realist sculpture is journalism at its best. It has an essential purpose — to instill hope in the people of New Orleans after Hurricane Katrina and enrich their lives through art (3) — and accomplishes this by representing those affected by Katrina through its design; its construction using perishable material, its symbolic choice of muse: the red tail hawk, and its massive stature, work together to tell the story of a city once betrayed by nature and infrastructure when the levees, which promised to keep the city safe by acting as flood blockades, broke (1). New Orleans, which exists at a low elevation in relation to sea level, is now known for this extremely vulnerable infrastructure. To reflect this vulnerability, The Realist was deliberately designed to perish, as it was constructed using only biodegradable materials, seemingly haphazardly cross-stitched together, looking like they could break at any moment. The Realist seems to consist mostly of sticks and brittle-looking planks of wood that resemble twigs or kindling. “Meaning to only last 3-5 years, they appear, fade, and disappear, adding a chapter to the life stories in their communities” (3). Like houses in New Orleans, The Realist was built knowing that it was at risk of being destroyed by the unpredictable weather patterns and would inevitably be disassembled. If this is true of houses in New Orleans, why, then, do people choose to live in a city that they know is at high risk of being destroyed once again? Perhaps for the same reasons that people enjoy temporary art installations like The Realist: people are meant to enjoy beauty while it lasts, even if it’s fleeting. Or perhaps because, like birds, the families who have lived in New Orleans for many years have an inclination to return to their homes. 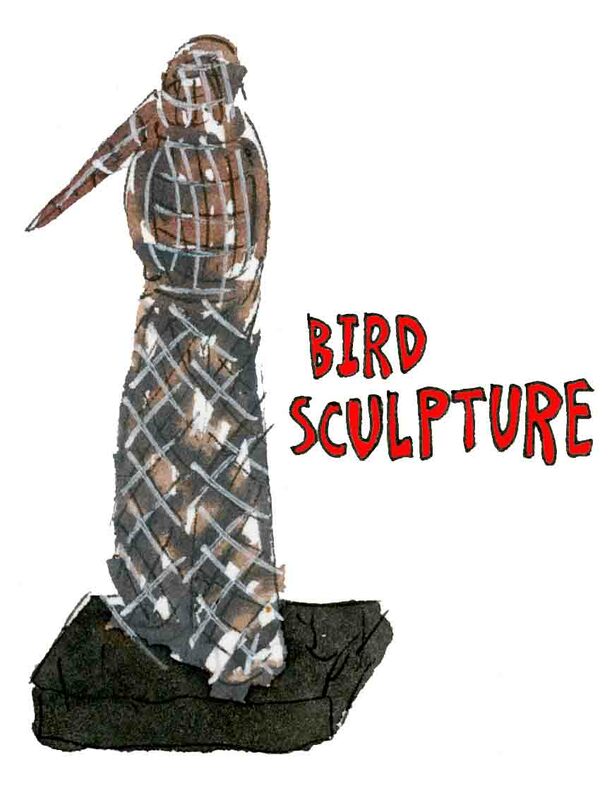 The Realist’s bird-shape and large stature also symbolize the struggle of the people affected by Katrina. Some lost their homes, forced to migrate elsewhere. Some never left. Of the migrants, some eventually made their way back to New Orleans while many others never could, despite the fact that their families dated back centuries in many cases (7). The bird imagery of The Realist represents each of these groups in unique ways. Like the millions of people displaced from their homes, forced to either seek refuge in places like The New Orleans Convention Center and The Superdome, or migrate out of the city entirely (8), birds migrate from areas of decreasing resources into areas of higher resources- like available food and suitable shelter (6). The bird imagery chosen by the Myth Makers may be interpreted as a representation of the migration patterns caused by Hurricane Katrina. However, The Realist is not depicted with large, pronounced wings. Instead, The Realist’s wings are not made noticeable at all. Flight is often one of the first things people associate with birds. So, perhaps the lack of attention on The Realist’s wings serves to represent those who never left New Orleans, just as the bird imagery itself symbolizes those who did. Further, The Realist is not just any bird. It’s a red tail hawk. The red tail hawk, the most common of all raptors, is famed for being a determined competitor. Red tail hawks are said to symbolize determination, strength, killer instinct, ambition, and the desire to soar (3). All of these attributes can be used to describe New Orleans and the survivors of Hurricane Katrina, who remain today, still rebuilding their homes and lives. The Realist’s design and large stature facilitate conversation about an unpleasant topic — forced migration and disproportionate return rates between displaced Whites and African Americans (4). A study entitled, “Race, socioeconomic status, and return migration to New Orleans after Hurricane Katrina,” concluded that due to socioeconomic status and institutionalized racism, “Blacks tended to live in areas that experienced greater flooding and hence suffered more severe housing damage which, in turn, led to their delayed return to the city” (4). While other mainstream media sources may not creatively report on this, the Myth Makers have done exactly that by erecting a larger-than-life sculpture in the middle of the CBD which has inevitably sparked conversation about its design, purpose, and what it represents. Even the name of the sculpture, The Realist, references one who “accepts a situation as it is and is prepared to deal with it accordingly” (Oxford Dictionaries). Not only is it a description of the red tail hawk, but a commentary on the way in which the people of New Orleans had to endure the neglect that they faced from the government in the wake of Hurricane Katrina. Not only was New Orleans left devastated by the hurricane, but it was left with the overwhelmingly challenging task of rebuilding a city that lies below sea level with shockingly little aid from the Bush administration (5). Similarly to the Myth Makers’ creative approach to discussing Katrina, several musicians penned powerful songs in response to this disappointing government let-down, including Jackson Browne, Harry Connick JR., Wyclef Jean and Norah Jones, Stevie Wonder, and Green day and U2 (2). Most of these songs ponder the ruin and abandonment, with lyrics like, “Now I don’t wish to offend/ No I don’t wish to start a fight/ But do you really think that the Gov would do nothin’/ If all those people were white?” from John Butler Trio’s “Gov Did Nuthin,” while others were uplifting, in an effort to raise the spirits of the suffering. Such is the case with Green Day and U2’s performance of “The Saints Are Coming,” which accompanied the New Orleans Saints as they returned to the Superdome. The two bands came together at the halftime show to give new meaning to a song originally penned by The Skids, and didn’t leave a dry eye in the stadium. Much like Green Day and U2’s cathartic tune, The Realist does not dwell on the obstacles and shortcomings, but rather serves as a therapeutic reminder that New Orleans can survive and thrive. The Realist is not meant to be a melancholy reminder of ruin and despair. “Sculptor Michael Manjarris founded Sculpture for New Orleans shortly after Hurricane Katrina with the mission of lifting the spirits of the people of New Orleans through public art and providing local and regional artists the opportunity to show in a public venue” (3). Rather, The Realist is an uplifting installation of strength and resilience into an environment that needs a bit of both in this era of rebuilding and recovering. Its abstract mode of storytelling is a call to imagination, participation in community, and appreciation for art. Michael Manjarris also stated, “What was once an industrial warehouse district is now becoming a world class, open air art museum. We understand how art can invigorate neighborhoods, adding to the quality of life in New Orleans” (3). Thus, the Myth Makers planted seeds of hope and rejuvenation on Poydras street, enriching the experience of community members. 1. Brinkley, Douglas. “The Broken Promise of the Levees That Failed New Orleans.” Smithsonian.com, Smithsonian Institution, 1 Sept. 2015, www.smithsonianmag.com/smithsonian-institution/broken-promise-levees-failed-new-orleans-180956326/. 3. Dodson, Donna. “The Avian Avatars Join Sculpture for New Orleans.” The Myth Makers Blogspot, 8 June 2016, themythmakers.blogspot.com/2016/06/the-avian-avatars-join-sculpture-for.html. 4. Fussell, Elizabeth et al. “Race, socioeconomic status, and return migration to New Orleans after Hurricane Katrina” Population and environment vol. 31,1-3 (2010): 20-42. 5. Lopez, German. “Hurricane Katrina, in 7 Essential Facts.” Vox.com, Vox Media, 28 Aug. 2015, www.vox.com/2015/8/23/9191907/hurricane-katrina. 6. Powell, Hugh. “The Basics of Bird Migration: How, Why, and Where.” , All About Birds, Cornell Lab of Ornithology, 25 Oct. 2017, www.allaboutbirds.org/the-basics-how-why-and-where-of-bird-migration/. 7. Times-Picayune, NOLA.com | The. “Hurricane Katrina Migration: Where Did People Go? Where Are They Coming from Now?” NOLA.com, NOLA.com, 26 Aug.2015, www.nola.com/katrina/index.ssf/2015/08/hurricane_katrina_migration_di.html. 8. Zimmermann, Kim Ann. “Hurricane Katrina: Facts, Damage & Aftermath.” LiveScience, Purch, 27 Aug. 2015, www.livescience.com/22522-hurricane-katrina-facts.html.